The Skills You Need at Every Stage of Your Career. The Software Guild has coding bootcamps to fit every stage of your life. You don’t need to know how to code to get started; our apprentice-level bootcamps and courses teach you the fundamental skills you need for junior-level roles. Four-to-six week online course. Learn foundational knowledge required by our apprentice coding bootcamps. 12-week synchronous bootcamp or part-time 10-month online course. Learn the skills you need to become a junior Java developer. 12-week synchronous bootcamp or part-time 10-month online course. Learn the skills you need to become a junior .NET/C# developer. Recruiting and training the right talent can require a significant investment of resources. With our customized corporate training solutions, you can help existing employees learn the skills they need to help your business succeed. Bring the training to your employees with our on-site options. Choose the days and times of the training, as well as the duration of the course, so your employees can maintainproductivity while learning new skills. Your company is unique. Shouldn’t your training be, too? Our customized programs ensure that your employees receive training in the specific skill sets you need, to help your business thrive. Flexibility is critical to success, which is why we are proud to offer several options for how students learn. Our fully online programs enable employees to study at their convenience, while blended options bring the best of face-to-face and online learning together. For proven results: see our reviews. The Software Guild has added more than 600 new developers to the field since 2013, and our graduates consistently give us positive reviews on sites like SwitchUp and Course Report. 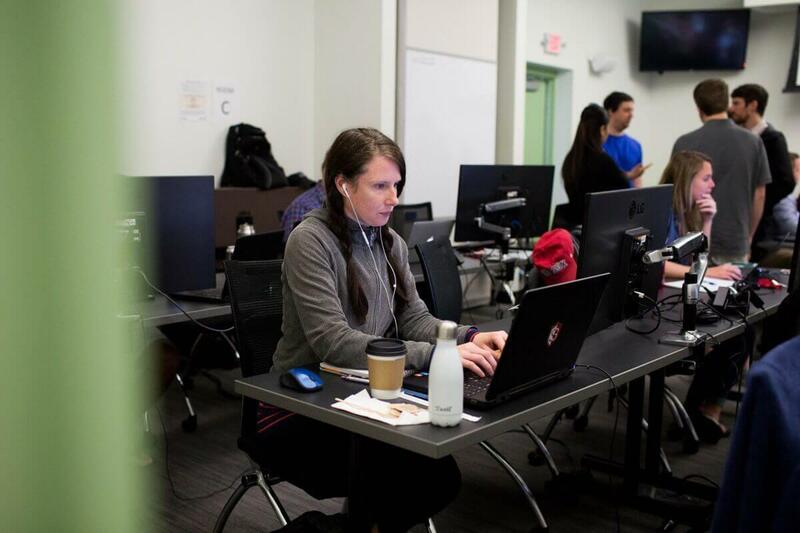 Our coding bootcamps target skills employers need. Learn some of the most in-demand languages, used by Fortune 500 companies, and gain practical, relevant knowledge you’ll use on the job. At The Software Guild, we help our apprentices prepare for their job search by offering resume help, interview training and networking opportunities with employers. Even after you graduate, you’ll have access to Software Guild curricula, so you can continue to improve your skills no matter what stage your career is in. Our employer network is available to all Guildies, and includes more than 450 employers including Target, Humana, Progressive, Best Buy, Nationwide and AmTrust. Guildies help Guildies, and our alumni network includes more than 600 graduates who you can stay in touch with to help build your network and keep it growing. Learn on-site in a rigorous, full-time coding bootcamp, or join our online coding bootcamp and get the skills you need from wherever you are, on a schedule that fits your life. Learn either Java or .NET/C#, two of the most in-demand programming languages, from proven experts at The Software Guild. Find the coding bootcamp location that works for you in either Louisville, Minneapolis or Atlanta. Want to learn to code on a schedule that works for you? Now you can with our part-time online bootcamp in Java and .NET/C#. Our graduates are hired quickly, love the work they do and remain in control of their careers. As an apprentice of The Software Guild, you have access to our network of 400+ employers and universities. The employer network is designed to match talented bootcamp graduates with great organizations. Employers, becoming part of The Software Guild’s employer network gives you access to highly qualified candidates who have the skills you’re looking for.